All honor to you, Mary! From you arose the sun of justice, Christ our God. Today is the patronal feast of the Abbey of Saint Mary, Our Lady of the Immaculate Conception. The abbey honors the Blessed Virgin Mary under the title of the Immaculate Conception, a solemn feast of the Church begun by Blessed Pope Pius IX on this date in 1854. 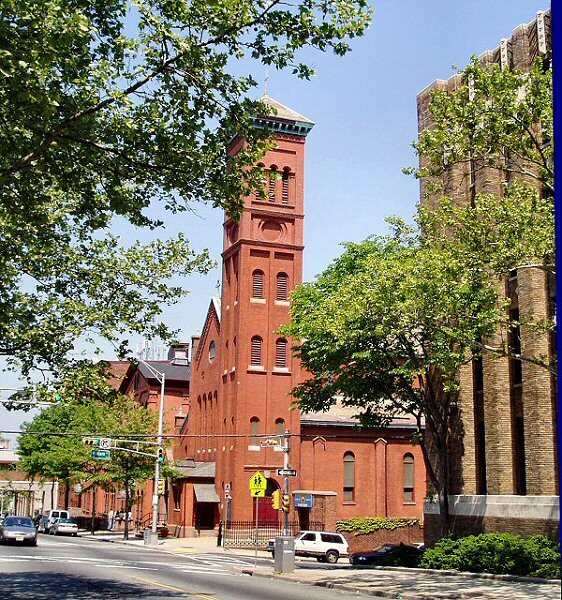 In 1857, this Benedictine abbey was founded, first in Newark, which moved to Morristown, New Jersey. This Marian feast acknowledges a dogma believed by Western Christians that states Mary was born without Original Sin. That is, she was free from sin in order to collaborate with God in the work of our redemption by giving birth to Jesus. A later feast of Mary, Our Lady of Lourdes (February 11) remembers the Virgin appearing to Saint Bernadette Soubirous 18 times between February 11 and July 16, 1858. 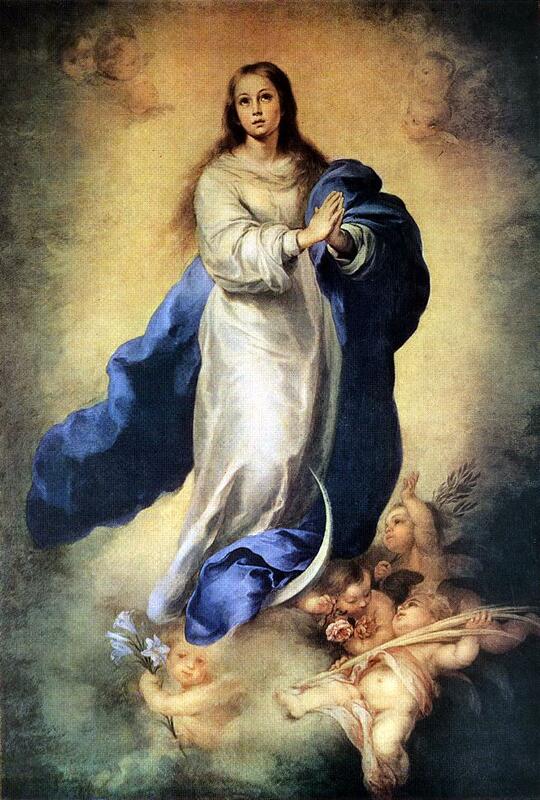 On March 25th of that year Mary identified herself as “I am the Immaculate Conception.” Today, also marks the end of the anniversary year of this dogma, 150 years! The Church in many places in the West has observed this feast since the 8th century; likewise there are Churches in the East that have honored Mary under this title, or one similar. The Abbey’s celebration was connected with Delbarton School. Father Abbot Giles with the members of the monastic community celebrated the Sacrifice of the Mass at 10 am. The full student body was present. Father Abbot spoke about the need to be men of prayer and of the importance of having a true devotion to the Blessed Virgin Mary as the monks of old did, and the monks of today, do. 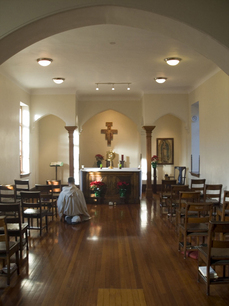 He noted that you can see the monks walking the property praying the rosary or sitting in front of the Blessed Sacrament doing so. pray for us you have recourse to you. Monks work. So beware of idle Benedictine monks –or any man who claimes to be monk for that matter –who don’t lift a finger to work around the house to work. 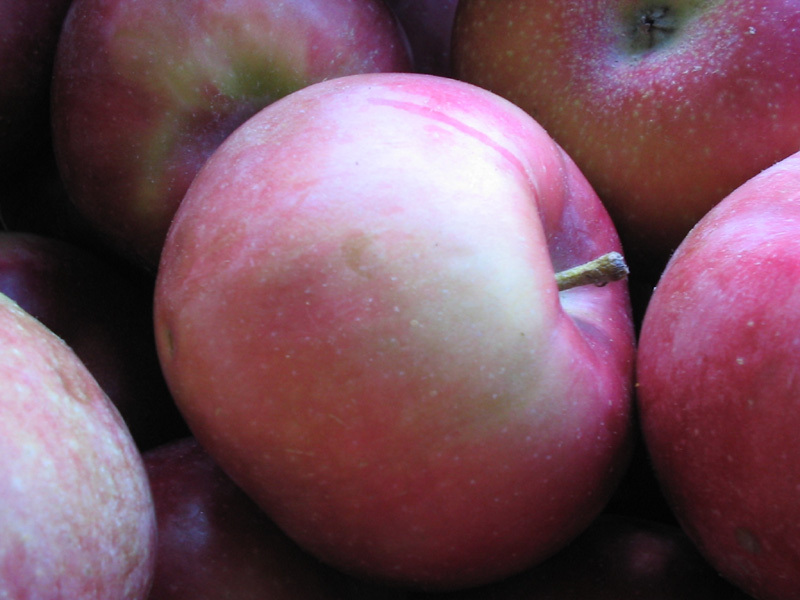 Today apples were picked from the abbey orchard. The seniors among us work in the orchard. Abbot Brian, Brother Tarcicius and I spent some time this afternoon picking macintosh apples. Trees some 70 years old continue to bear fruit. Makes you wonder why these old apple trees continue to bear fruit and older institutions like Lehman Brothers collapse; the obvious notwithstanding. The good news is that some apples went to the abbey kitchen and some went to the football team. The apples were beautiful and delicious! Saint Charles Borromeo, patron of apple orchards: pray for us! Since in July the Abbot and I have read together the Rule of Saint Benedict now it is time to go deeper. So, we’re going to be reading Benedictine Father Terrence Kardong’s magisterial work on the Holy Rule and some chapters in Benedictine Sister Aquinata Bockman’s study on the Rule. Through July and August a small book club was formed to discuss Fr Jeremy Driscoll’s book What Happens at Mass, a wonderful introduction for some and an appropriate reminder for others on the theology of the Mass. It is a thorough exposition on the Church’s theology of the Mass. This work is not as comprehensive as Driscoll’s Theology at the Eucharistic Table, which is aimed at Master’s students and above. Above all, what sets a monk’s formation apart from others is the daily practice of Lectio Divina. 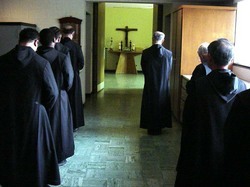 The supreme gift of monasticism to the Church. 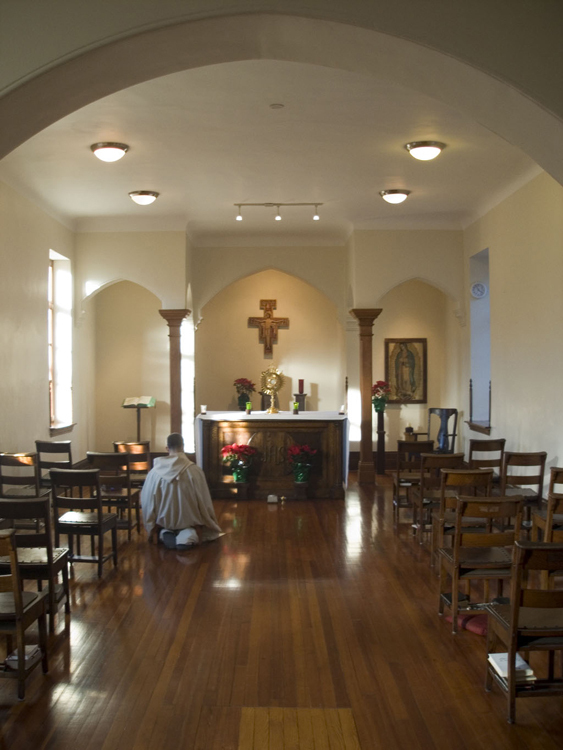 This morning, August 28th, began with the Sacrifice of the Mass offered by Father Jeremiah, a monk of Saint Mary’s Abbey, at Villa Walsh, The Institute of the Religious Teachers Filippini. 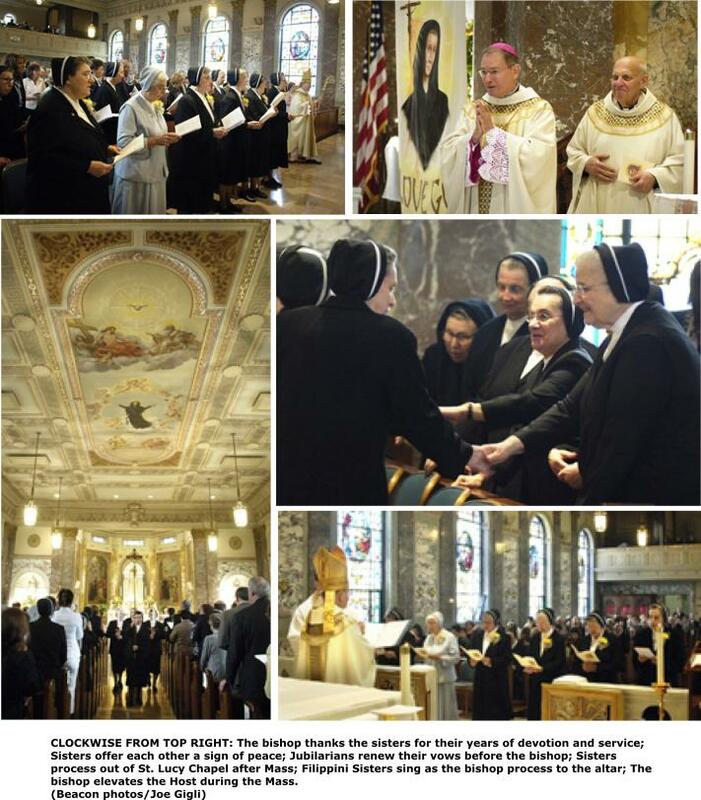 The monks of Saint Mary’s Abbey have offered Mass for the sisters for many decades. We had a modest and delightful breakfast with Sister Betty Jean, the Provincial of the Filippini sisters and some other sisters. The sisters’ patience with me was grand because I had so many questions about the Congregation; I had never met a Filippini sister before and I was intrigued by their charism. The vocation of a Filippini sister, based on what Saint Lucy Filippini and Cardinal Mark Anthony Barbarigo gave to the Church is your fundamental living of the Gospel being a contemplative in action, that is, A Filippini sister has a life of prayer with her life of ministry. Sounds like the Jesuits and other orders founded since the 16th century; and you can see these sisters are serious about their vocation when you meet them. Saint Lucy and the Cardinal founded schools of Christian Doctrine for girls in Italy, ministered to the poor and the sick, conducted retreats and guided the women preparing for marriage. What more does the Church need? to visit with the Benedictine monks, particularly Brothers Maximilian and Patrick. We prayed Mid-day prayer in a beautiful abbey church, toured the school, Saint Mary’s Parish and the abbey. Newark Abbey is the original site of the Benedictine monks of the American-Cassinese Congregation sent by Archabbot Boniface Wimmer in 1857 to Newark. It is from this abbey that Saint Anselm’s Abbey and later college where founded in Manchester, NH, and Saint Mary’s Abbey in Morristown, NJ. Brothers Maximilian and Patrick were very gracious hosts and great fun. 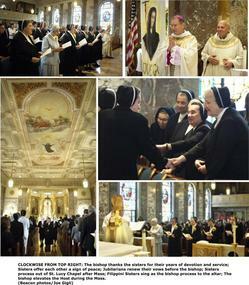 We lunched at The Tops Diner (East Newark) and visited Newark’s Basilica of the Sacred Heart. You would not believe the beauty of this cathedral church! Even Pope John Paul II made a visit here and former President William Clinton remarked how surprised he was to see such a magnificent in Newark, New Jersey. A brief video was produced in 2007 by the NJ Star Ledger on the Newark Abbey monks, have a look. 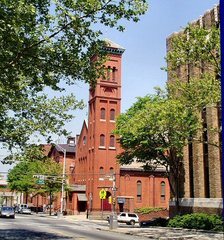 The last treat of the day was the afternoon visit to the Community of the Franciscan Friars of the Renewal based at the Friary of the Blessed Sacrament (Newark, NJ). This is the group founded by Father Benedict Groeschel and seven other Capuchin friars in 1987. The friary was the former the Monastery of Saint Dominic (nuns of the 2nd order of the Order of Preachers). It was indeed a privilege to visit the friary: it was peaceful, prayer-filled and beautiful (much work has been in the 4 years since the coming of the friars). When the nuns moved to other monasteries, their dead were exhumed and reburied in a local cemetery, including the incorrupt body of an extern sister known for holiness, Sister Mary of the Blessed Sacrament who died in 1899. Our host at the friary was Father Richard who graciously illustrated for us the life of the friars: their simple life, their prayer and their clear witness to the Gospel of Jesus Christ. What I experienced was genuine and one which I have confidence is made by God for service in the Church. What a day! Say a prayer for the Filippini sisters, the monks of Newark and the Friars of the Renewal: they need our moral and spiritual solidarity, indeed they need we ought to be in friendship with them. Perhaps more accurately, we need their witness!